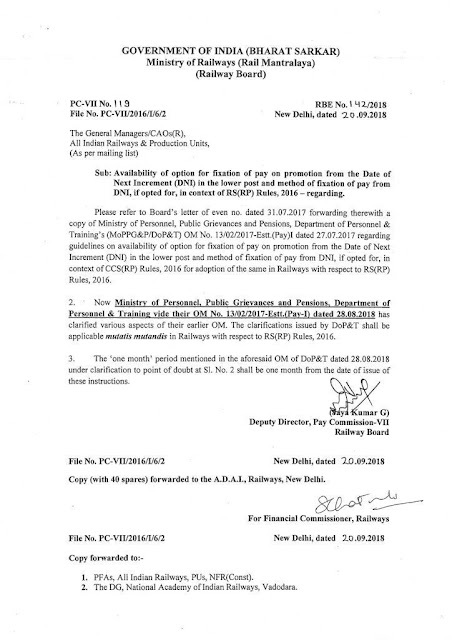 Sub: Availability of option for fixation of pay on promotion from the Date of Next Increment (DNI) in the lower post and method of fixation of pay from DNI, if opted for, in context of Rs(RP) Rules,2016 – regarding. Please refer to Board’s letter of even no. dated 31.07.2017 forwarding therewith a copy of Ministry of Personnel, Public Grievances and pensions, Department of Personnel & Training’s (MoPPG&P/DoP&T) OM No.13/02/2017-Estt. (Pay)I dated 27.07.2017 regarding guidelines on availability of option for fixation of pay on promotion from the Date of Next Increment (DNI) in the lower post and method of fixation of pay from DNI, if opted for, in context of CCS(RP) Rules,2016 for adoption of the same in Railways with respect to RS(RP) Rules,2016. 2. 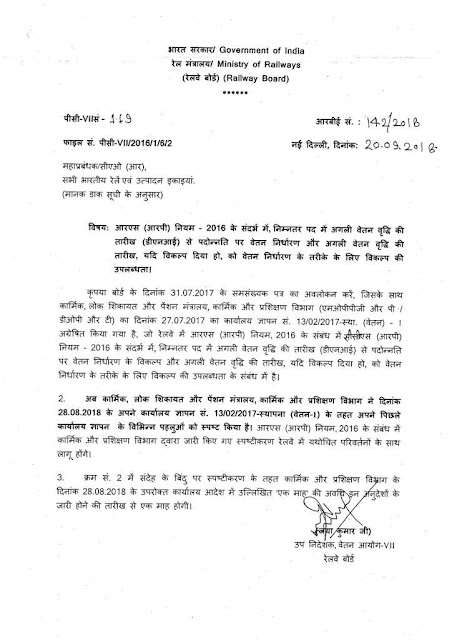 Now Ministry of Personnel, Public Grievances and Pensions, Department of personnel & Training vide their OM No.13/02/2017-Estt. (Pay-I) dated 28.08.2018 has clarified various aspects of their earlier OM. The clarifications issued by DoP&T shall be applicable mutatis mutandis in Railways with respect to RS(RP) Rules,2016. 3. The ‘one month’ period mentioned in the aforesaid OM of DoP&T dated 28.08.2018 under clarification to point of doubt as Sl.No.2 shall be one month from the date of issue of these instructions.